Jakarta Representatives Council for Indonesian Real Estate (DPD REI) supports Jakarta Government's zero down payment program.
" Jakarta Government cooperate with REI to support house ownership program"
Signing procession as form of support is done simultaneously with DPD REI committee inauguration for 2017-2020 periods at City Hall, Jl. Medan Merdeka Selatan, Gambir, Central Jakarta. 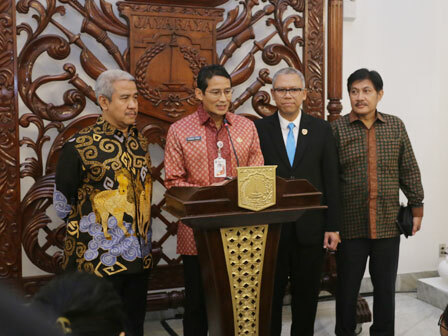 Jakarta Vice Governor, Sandiaga Uno said, this cooperation can provide more than 300 thousand houses in affordable price as required by Jakartans. "Jakarta Government cooperate with REI to support house ownership program," he mentioned, Thursday (1/18). He assessed synergy to build zero down payment housing can create more job opportunities. He is targeting to create 50-60 thousand new job opportunities. According to him, coordination between BI, OJK, banking, and other stakeholders is quite good, especially related to regulation which is needed to be prepared. "We will adjust it, as long as it doesn't violate the rules. We will implement the best scheme for this," he stated. Meanwhile, REI Central Representative Council Head, Soelaeman Soemawinata stated, DPP REI will support all government policies which is favor to citizen. "We want to take a part for this nation, We are ready to support and obey applicable regulation," he added. For Information, Amran Nukman is chosen as DPD REI Head for 2017-2020 periods. Then Arvin F. Iskandar as Deputy Head and M. Taufik as Secretary.